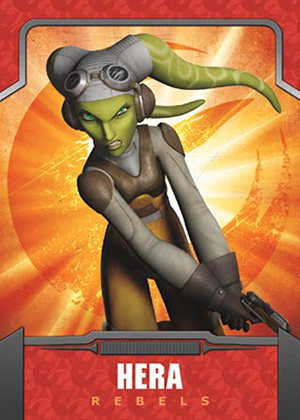 2015 Topps Star Wars Rebels trading cards usher in a new phase for the franchise. Based on the animated cartoon that had a successful first season on Disney XD, it's a retail-only product that is strikingly simple. The base set has 100 cards that not only cover the first batch of episodes, but introduce collectors to the show's characters and some of the vehicles. Base cards have a Rainbow Foil parallel. Every pack of 2015 Topps Star Wars Rebels comes with a Sticker insert. The set has 20 total cards. There are also Tattoos, which fall 1:8 packs. Because it's a retail product, hits are stressed a lot less than most every other set Star Wars trading card set. That said, Sketch Cards are randomly inserted. For those holding out hope that the hobby would finally get a Freddy Prinze Jr. autograph card, you're going to have to wait a little (or a lot) longer. The product has no signed cards. 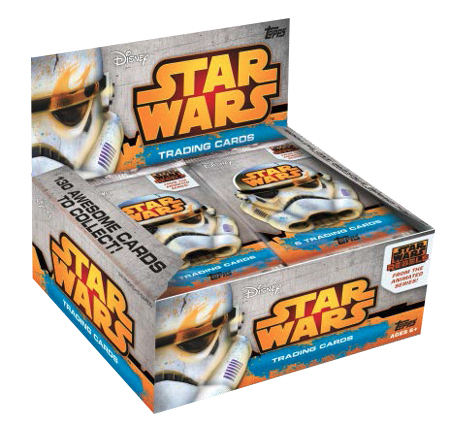 2015 Topps Star Wars Rebels trading cards are available in a pair of pack types. Basic packs have six cards. Jumbo packs come with 18. As far as a timeline goes, Star Wars Rebels is set more than a decade after the events of Revenge of the Sith and a few years before the original trilogy kicked off. While there are some familiar names, the characters are predominantly new. A list of artists has not been released by Topps. So does this set have a parallel foil set? Tim � It does appear to be that way.